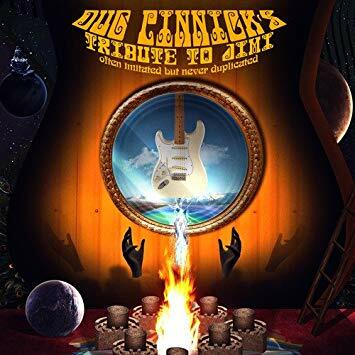 Dug Pinnick’s Tribute to Jimi: Often Imitated but Never Duplicated is a fitting homage to the guitar great, in part because Pinnick is an ideal musician for pulling off a project such as this. Having spent decades as the bassist and singer for King’s X, which just might be the most underrated power trio in rock and roll history, he is the perfect candidate to record tunes by the Jimi Hendrix Experience, which is arguably rock and roll’s preeminent trio. Also, upon hearing Pinnick’s vocals on these tracks, the listener is hard-pressed to think of a more fitting vocalist to sing these songs. The bulk of the guitar duties are handled by Tracey “Spacey T” Singleton from the groundbreaking metal group Sound Barrier, one of the first African American heavy metal bands. While this tribute to Jimi is not a note-for-note replication of Hendrix material, it is also not a reinvention. The eight tracks bear tremendous amounts of similarity to the originals. However, there is a general freshness to this recording that results from the presence of stylistically indoctrinated musicians who are willing to occasionally color just outside the lines. The sonic similarity to the originals is not surprising since this recording was made with that intention. Pinnick stated that they had wanted “to recreate the analog recording process as closely to the original recordings as possible.” With this in mind, they used as many of the same types of equipment used by Hendrix and company as was feasible. The result is a modern recording that maintains a vintage feel. While the playing on the album has had the influence of fifty more years of musical evolution, the actual guitar tones maintain the characteristics of the late ‘60s. “If 6 Was 9” serves as a perfect example of this. Although there are variations in note choice from the original, the guitar sounds as if it was recorded using the exact same rig that Hendrix used back in 1967. Song selection for a tribute album can always be tricky. When dealing with the catalog of an artist such as Jimi Hendrix, who had so many great songs, the difficulty in selecting eight tracks is compounded. Nevertheless, Pinnick did a great job in narrowing down the scope of the project by sticking with songs from the three studio albums released during Hendrix’s lifetime—Are You Experienced (1967), Axis: Bold as Love (1967), and Electric Ladyland (1968). Tracks include psychedelic standards such as “Are You Experienced” and “Purple Haze,” songs in the pop vein such as “Fire” and “Crosstown Traffic,” and iconic Hendrix tracks such as “Voodoo Child (Slight Return).” Of course, “All Along the Watchtower” is also present. It is perhaps ironic—or even fitting—that a cover of a cover would be present on this album. Nevertheless, any Hendrix project would be incomplete without “All Along the Watchtower,” which along with Aretha Franklin’s version of Otis Redding’s “Respect,” stands out as one of the greatest cover songs of all time. “Are You Experienced” is the first track, and the impeccable backwards guitar sets the bar high for the remainder of the album regarding attention to detail in capturing the spirit of the originals. This attention to detail is evident throughout the album, and “Crosstown Traffic” continues this sentiment by including the kazoo part from the original. Other standout tracks include “Purple Haze,” driven by Pinnick’s signature 12-string bass sound. Also, though covered many times, Pinnick’s version of “All Along the Watchtower” serves as one of the more authentic covers of the Hendrix classic. Worth mentioning too is “Voodoo Child (Slight Return),” which closes the album in a blistering fashion. As a testament to his phenomenal output with King’s X, Pinnick will always attract that band’s loyal fans. Ideally, others will also find this recording and discover what diehard King’s X fans have known for years—that Dug Pinnick is one of the great rock and roll talents. Tribute to Jimi is one of the best tributes to Hendrix ever released, and it is obvious that the musicians had fun making this album. The final product is a recording that builds upon the experimental spirit of Hendrix while still maintaining a stylistic affinity to the original recordings. As should generally be the case with performances of Hendrix songs, the guitar playing on this album is scorching, and Pinnick’s powerful voice adds a new dimension to these classics. It is truly hard to envision this album disappointing any rock and roll fan.